PEKATEX® RFP Constructs turn an old dream into reality: which architect, designer or craftsman has not been on the outlook for a structural material allowing universal and harmonic creations and designs, enabling to build simply, but still precisely, practically, attractively, with low weight and long life, difficult to beat pricewise – as yet more than once, alas quite in vain ?! Now with PEKATEX® RFP Constructs made of high performance glass grid fabric, sealed into position by unsaturated polyester resin and PEKATEX® Skeleton Profiles produced of the same material, the dream comes true. PEKATEX® RFP Constructs meet promises: always light in weight, yet strong and versatile, enabling you to design, construct and build – precisely, expeditiously, small or big in size. Whether you require stiffened sheets, panels for example, or walls, ceilings, installations, transparencies, columns, fences, moulds, car bodies, emergency or permanent housing, with PEKATEX® you are invited to have next to unlimited inspirations. PEKATEX® RFP Constructs can be cut to size simply by knife, saw or disk cutter and can also be adapted to shape, across and intersected also along the longitudinal struts. 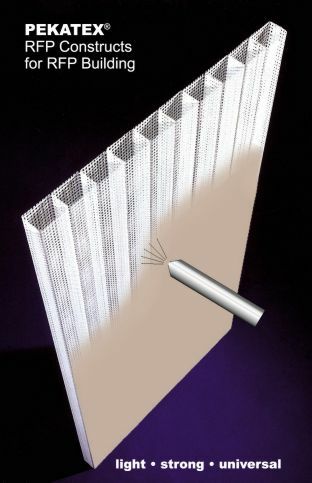 The netlike open surfaces of PEKATEX® RFP Constructs are designed in such a manner that the resin from laminates or sprayed lay-ups will not unintentionally penetrate, but bond and form a mechanical grip with and in the grid windows of PEKATEX® RFP Constructs. PEKATEX® RFP Constructs accept tensile, compressive and shear loads. Apart from the applied laminates and/or spray-ups, they will considerably contribute to the static of the whole structure. PEKATEX® RFP Constructs will provide space between coatings such as for wiring, piping, for inserts and for other purposes. Due to its gridlike open structure PEKATEX® RFP Constructs are vented throughout if bordered accordingly. Condensation cannot accumulate and the construction will stay dry and retain its initial weight. PEKATEX® RFP Constructs can be supplied filled with mineral wool so that the end product can be equipped with thermal insulation, and can feature protection against noise and fire. For bordering and joining the elements made of PEKATEX® RFP Constructs, a number of tongue / groove - systems respectively PEKATEX® Skeleton Profiles manufactured of the same material as PEKATEX® RFP Constructs are available.